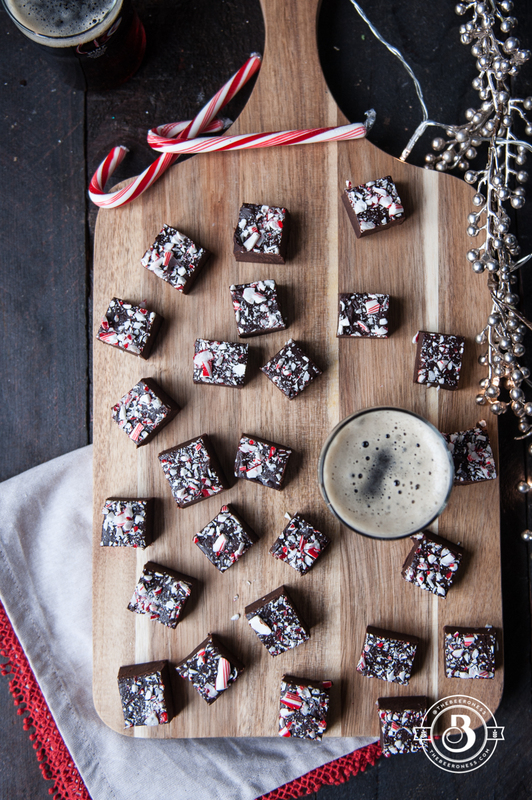 Holiday Ale Candy Cane Truffle Fudge. Only takes 10 minutes, and it’s crazy good. Winter ales make me glad it’s December. The frozen roads, crowded stores, jam-packed schedules are the price of admission to the best month of beer all year long. We still have some fresh hop beers from hop harvest that happened a few months ago, barrel aged beers are hitting the bottle shops in full force, and winter ales have showed up to join the party. So…what is a winter ale? Glad you asked, and the answer is both really simple and completely complicated. 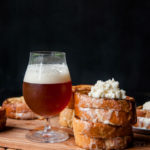 Basically a winter ale is a beer released in November or December that has a higher than average ABV (about 7% or higher), often maltier and sweeter than your average beer, and features spices often found in holiday meals such as cloves, cinnamon, orange, and nutmeg. Of course there are hundreds of exceptions and many people consider barrel aged stouts (that really don’t fit that definition) to fall under the category of “winter ales.” People call these “winter ales,” “winter warmers,” “holiday ales,” or “christmas ales.” They make excellent sharing beers due to mostly being sold in the large bomber style bottles and having a generous dose of booze for your pint. 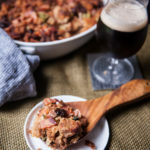 The flavors go incredibly well with holiday food, especially if you decide to serve duck or goose as your holiday feast. Line an 8x8 baking pan with wax paper; set aside. In the top of a double boiler over gently simmering water add the chocolate, 1/3 cup beer, and sweetened condensed milk. Stir until well combined and chocolate is melted. Stir in the vanilla extract and remaining 2 tablespoons beer. Pour into prepared pan. Top with crushed candy canes. Note: weight ounces and fluid ounces are not the same. Weigh the chocolate on a kitchen scale to get an accurate measurement, or refer to the weight ounces listed on the chocolate package. Note: If you don’t own a double boiler, place a metal or heat safe glass bowl over a pot of water. Make sure that the bottom of the bowl doesn’t touch the water. Bring the water to a gentle simmer; do not boil. Would this work with white chocolate as well? Thinking of making a layered “double” batch for office holiday treats in a 9’x13″ pan. 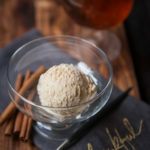 Or would the beer muck up the color of the white chocolate? Either way, this just solved my dilemma of “what to make this year?”! Thank you! White chocolate is more difficult to work with because it isn’t actually chocolate it’s cocoa butter and milk solids. it can be really temperamental. I’ve never tried it with beer but I do worry that it would seize. Mad Elf is one of my favorite winter beers! 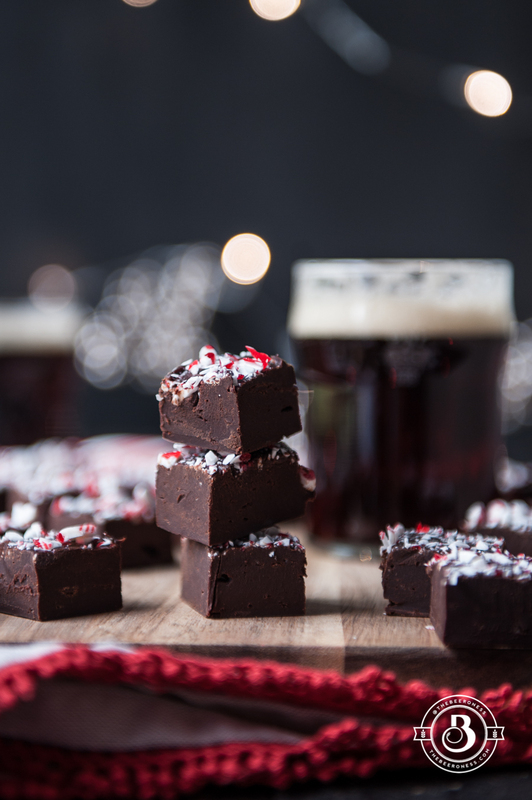 This fudge looks fantastic – and so festive! This looks awesome! 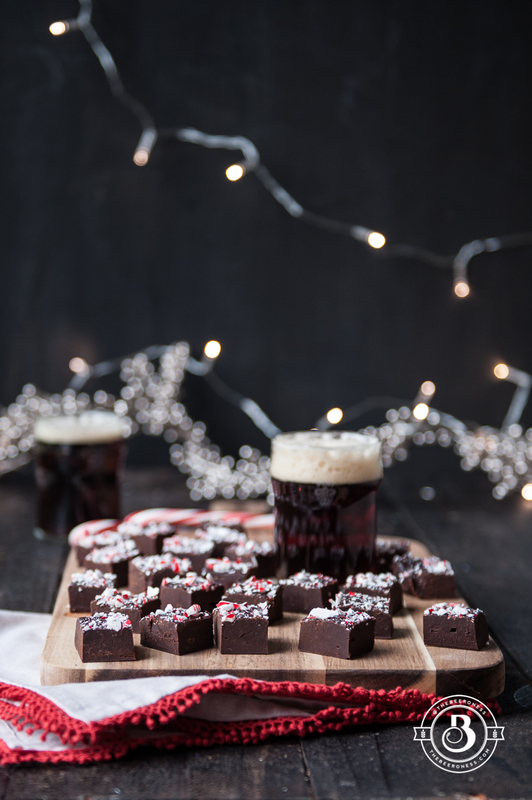 Chocolate, peppermint and beer are 3 of my favorite things!! Do you use dark, semi-sweet, milk or a mixture of these chocolates? What a great idea! 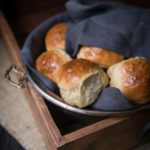 These sound so good, going to need to try this weekend. Great photos too, so festive! Yum! Have you tried Golden Road’s gingerbread stout? It’s delicious by itself and great to cook with.